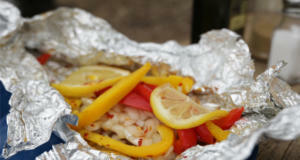 Other than hot dogs, foil packet meals are one of the easiest things to make while out camping. 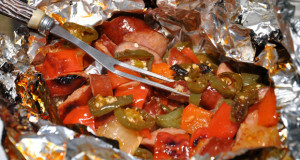 With an endless array of options from fish to sausage and vegetables you can pretty much stuff anything in combination of things in a foil packet and it will turn out tasty. 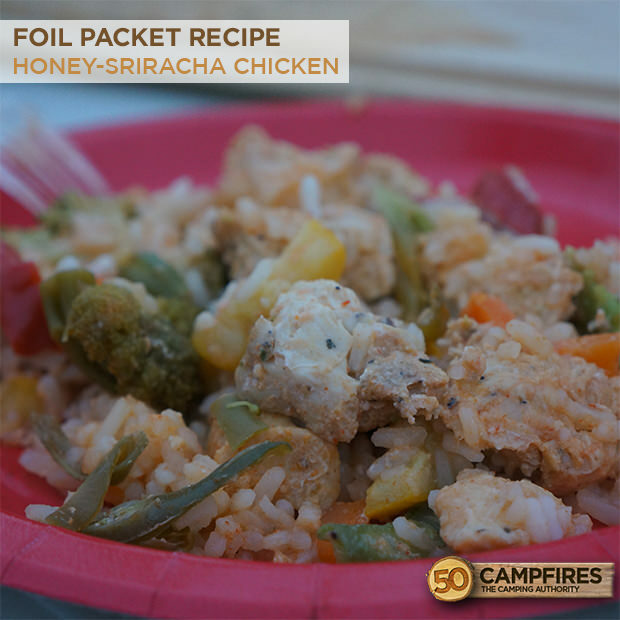 If you’re looking to kick it up a bit, this Honey-Sriracha Chicken Foil Packet meal is delicious. 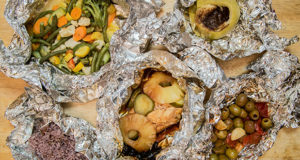 Another glorious thing about foil packet meals is the ability to make most of it at home, wrap it up and just toss it on the grill or campfire grate when you’re ready to cook. 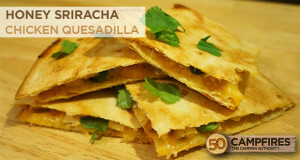 For this recipe, I was able to get the honey and sriracha mix together so that we could just easily pour it over our mixture. 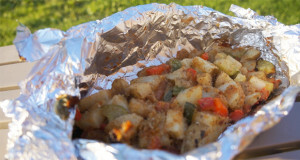 I also went a step farther and cut up my chicken in to chunks so I didn’t have to do that on the picnic table. The assembly of the chicken foil packet was pretty simple, just soak instant rice in water for about 5 minutes, add your thawed veggies. 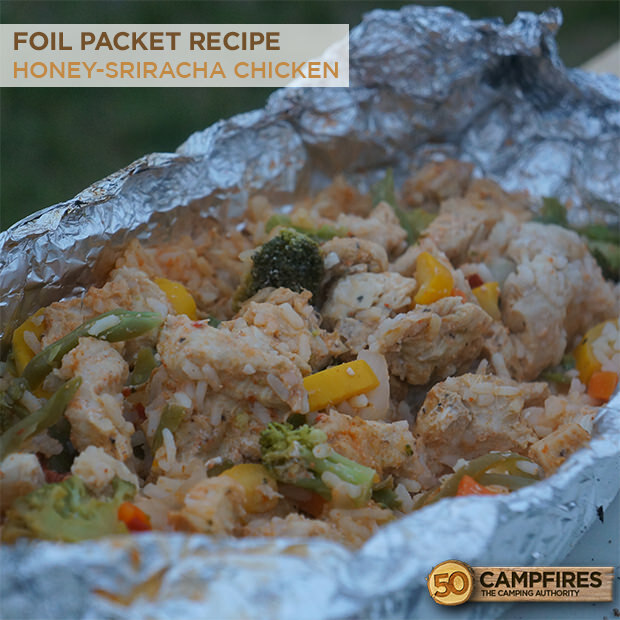 Once soaked in, put in your foil packet and top with chicken and the honey-sriracha mixture. 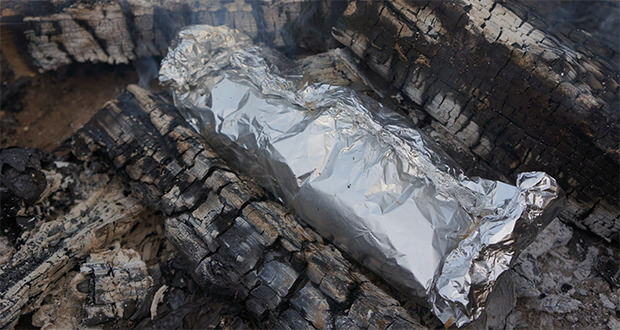 If you have a good fire going with plenty of coals, the meal can be done in 25-30 minutes. 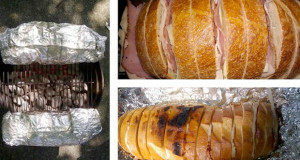 When we originally found this recipe over at one of our favorite blogs, we wondered how the flavors would meld together. Let’s just say the sweet and spicy is a fantastic combination. In small bowl, mix rice and water. Soak 5 minutes; drain. 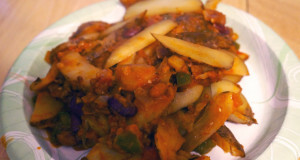 Stir in thawed vegetables. 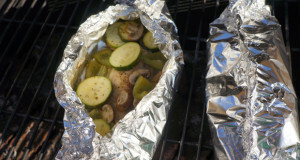 Use 4 sheets of heavy-duty foil. Spray center of one side of each with cooking spray. Spoon one-fourth of the rice mixture on center of each sheet. Top each with chicken. In small bowl, mix honey, lime juice and Sriracha sauce. Spoon evenly over chicken. 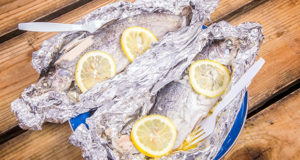 Seal the foil packet, allowing space for heat circulation and expansion. 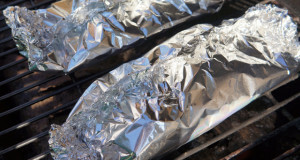 Put the foil packet in the coals of the fire or on the grill for about 30 minutes or until juice of chicken is clear. Let stand 5 minutes. Sprinkle with cilantro.